Tank Cleaning is an essential part of the supply chain of chemicals, foodstuff and other products. The tank to be cleaned may be a tank vehicle, tank container or any other receptacle previously used for holding products that needs to be washed after it is emptied. In case of foodstuffs, tanks should be more frequently cleaned even if they are used for the same product to avoid biological degradation of the foodstuff remaining in the tank after discharging its load.Cleaning is performed by cold or hot water, sometimes with the addition of acidic or alkaline cleaning agents, and, in some cases effective cleaning can be achieved only by using surfactants. An essential part of the tank cleaning process is the treatment of the aqueous and gaseous effluents. The amount of the aqueous stream from one cleaning step can be from as little as a few hundred liters to the full total of the wash process when cleaning a 25 m³ tank, but its nature changes from one tank to another depending on the original content of the tank. 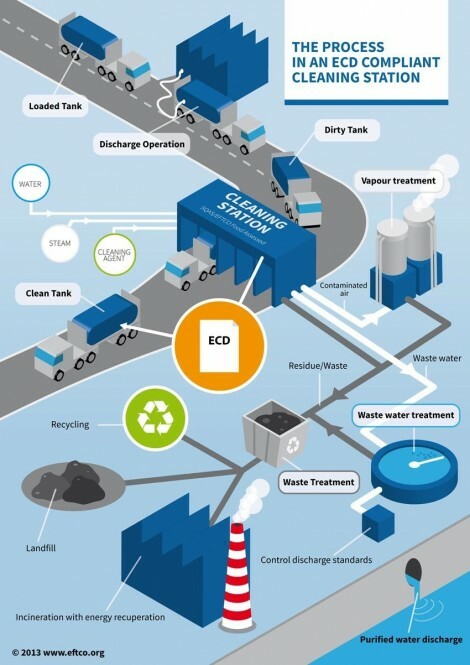 The changing, wide range of products cleaned means the resulting wash water is a variable mixture that cannot be foreseen; as a result, tank cleaning companies have to be professionally adept at the environmental treatment of effluent streams in a responsible way through specially developed and adaptable systems. The cleaning stations affiliated to EFTCO are active in developing green treatment solutions.